Reed Sigmund in HOW THE GRINCH STOLE CHRISTMAS. Photo by Dan Norman. Ready or not, the 2018 Christmas season has started. How do I know this? It’s because of the discombobulating rush of holiday shows: the big G begins (on Nov 13) its kazillionth production of A Christmas Carol; there’s the myriad versions of the Nutcracker story (including the Naughty Nutcracker); the excellent All Is Calm at Latté Da; the totally similar Silent Night at MN Opera; Penumbra’s rousing Black Nativity; and I have but scratched the surface. Pick up a paper and read the ads. And now there’s the Children’s Theatre Co.’s umteenth production of the breathlessly wonderful Dr. Seuss‘s How The Grinch Stole Christmas (CTC through Jan 6). Do I need to summarize the plot? El evil Señor Grinch, living on a frozen mountaintop overlooking Whoville, hears the hated Whos singing disgusting carols. “I hate Christmas,” he hisses. So he decides to steal it. He descends into Whoville and takes every present, every morsel of goodiness in the fridge, the tree, the yule log, everything. To no avail: adorable little Cindy-Lou Who still sings. The Christmas spirit is bred in her diminutive bones. Hearing her, the Grinch’s heart grows three sizes. He returns all the presents, wishes everyone merry and all live happily thereafter. And then there’s Reed Sigmund as his Royal Nastiness; he with the greasy sweat and the poop-eating grin; and the perfect paunch; I will never hear a reference to the color green without thinking of him; even Cindy-Lou feels sorry for him. The Grinch. (“You’re as cuddly as cactus; I wouldn’t touch you with a 39 and half foot pole.”) Sigmund is an evil genius (emphasis on the “evil.”) He carries the play. He is endlessly resourceful, yet never over-the-top. Wow-dow. Director Peter C. Brosius focuses the cast and oversees a team of crack designers. Thanks to Brosius, How The Grinch Stole Christmas is a veritable feast. The ultimate purpose of the Grinch (and A Christmas Carol, and Black Nativity, the Nutcrackers, et al) is to establish a holiday tradition of play-going. At Christmas we trim the tree, eat the turkey, sing the carols, buybuybuy the presents and we go to (fill-in-the-blank, for the theater of your choice). Tempted as I am to be cynical about this, it’s a tradition I strongly favor. 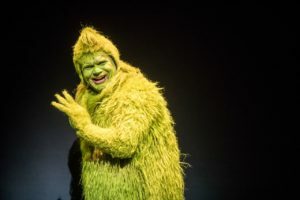 If you want to establish a similar Christmas tradition – and as a theater-lover you should – the Grinch is your man. John Olive is a writer living in Minneapolis. His book, Tell Me A Story In The Dark, about the magic of bedtime stories, has been published. John’s The Voice Of The Prairie has been performed 100 plus times and ditto Minnesota Moon and, more recently, his adaptation of Sideways Stories From Wayside School. Please visit John’s informational website.